Place the dried herbs in a 1L glass measuring cup and fill with boiling water to 500mL. Let steep for 1 hour. In a 500mL squeeze bottle, mix the essential oils with an equal amount of solubilizer. 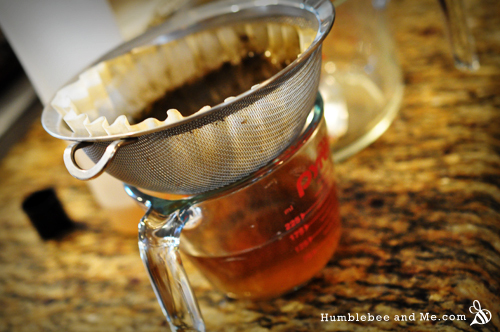 Using a coffee filter and a fine sieve, strain the herbs out of the herb mixture. Discard the herbs. You will have ~400mL of herb infused water. Pour a bit of the herb water into the bottle, and swish to combine. Add the rest of the herb water. Top off with apple cider vinegar. Shake to combine. To use, rinse the hair with it.